Our journey began in the small town of Cioch, south of Gryrax in the Principality of the Ulek, on an peninsula into the Azure Sea. Below is a look at our travelled path (Red) and out pending journey (Green). All within the area know as The Flanaess. 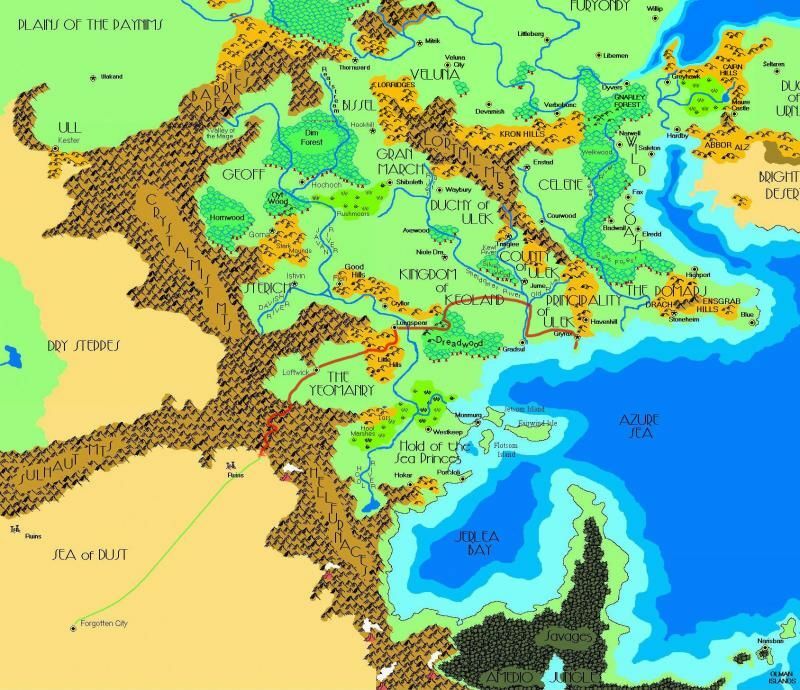 Some of our story is found here: Introduction to LukeDev75's Greyhawk Campaign. While at the Bedouin camp, Iris and Onyx have the opportunity to learn new spells associated a desert environment. Wizard spells have a cost associated to them, each reflected at the end of the short description. For details of the spell(s) interested in, please contact the DM. Red spells are harder to learn and more expensive. Abjur Transcribe Symbol: Safely moves an untriggered magical symbol to another location 800 gp. Cloak of Shade: Touched creature gains protection from heat and sun.